The Vancouver Robotics Club is now regularly holding a new event (the Basic Table Top Challenge) at every meeting as a way to motivate people to build robots. It worked for me, I scrounged around my various bins and boxes for parts to build something quite different this time around. 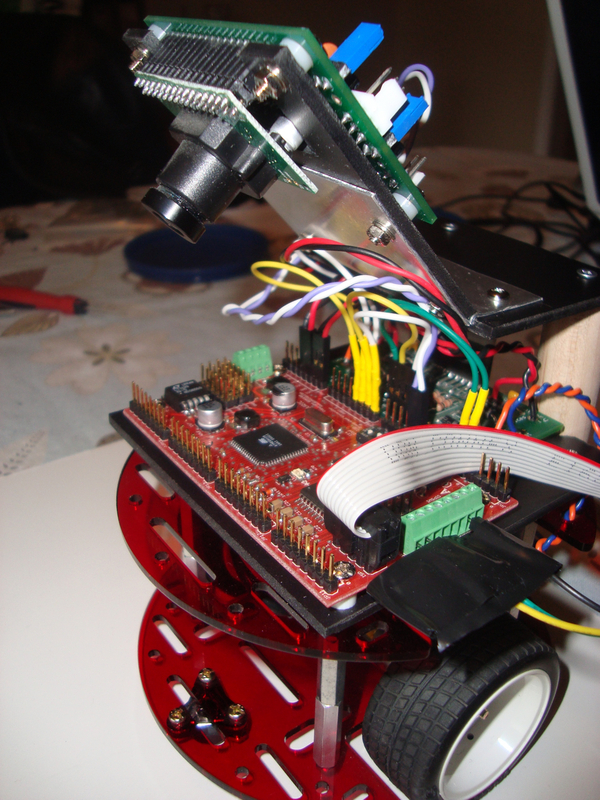 My latest robot “Optic Nerve” uses a AVRcam as its only sensor. Here is a video of one (4.4mb) of one attempt. As you can see, it didn’t actually work 100% correctly! The basic algorithm is to follow the black line along the right side of the course, counting the number of horizontal black lines crossed. When the right number of lines is crossed the robot spins around and tries to follow the edge again. In this example video you can see the “spin” rotates too far and it cannot correct for it. I still need to improve that approach. I’ll try again at the next meeting in May, hopefully I’ll be able to improve the “spin” to be more successful. If you are in the Vancouver area on May 17th then stop by and see for yourself.